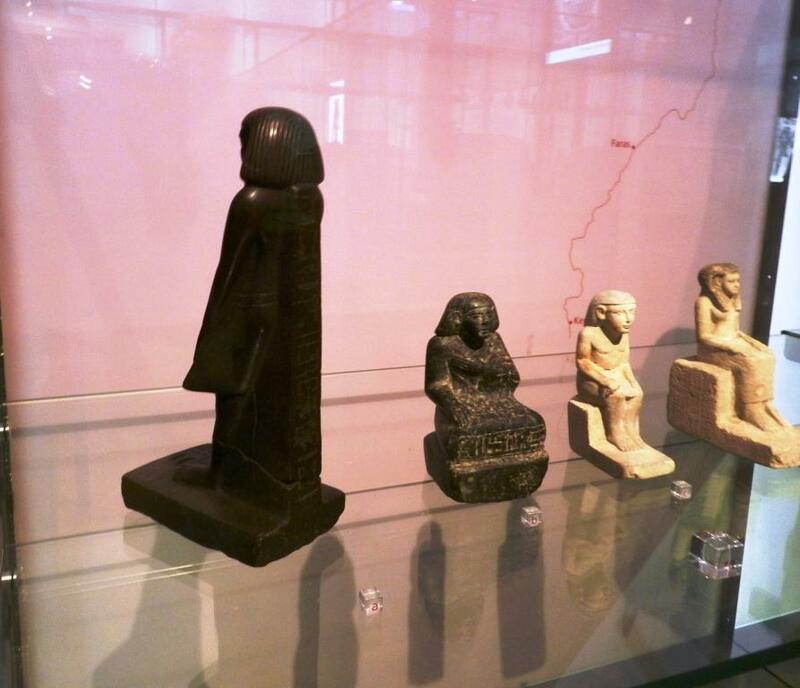 Back in February of this year, Manchester Museum‘s Egyptian artifacts curator Campbell Price was walking by a display case of Middle Kingdom funerary statuettes when he noticed one of the figurines was facing the back. 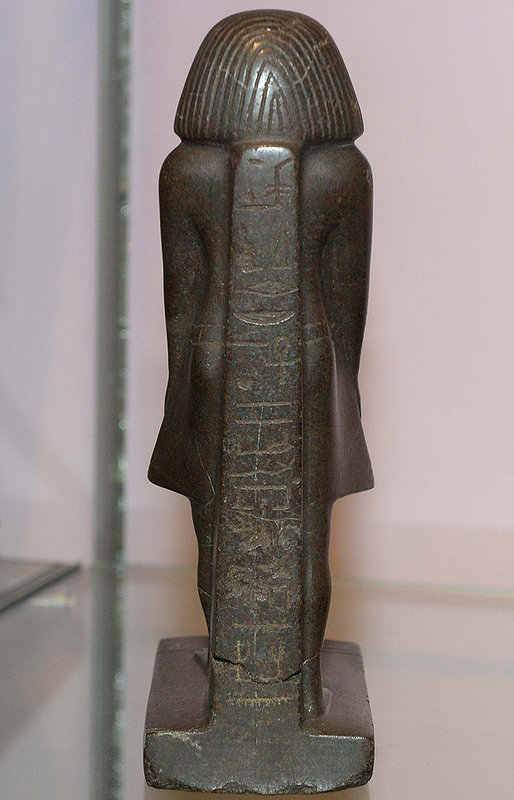 Very few people have the keys to the display case and if any one of them had turned the 3,800-year-old statue around for a reason, like to expose the prayer inscribed on the back, they would have checked with him first. He put it back facing forward, but the next time he noticed the statuette was turned at a different angle. The day after it was at a third angle. The sentence is finished with an inscription of the deceased’s name on the front of the statuette base. 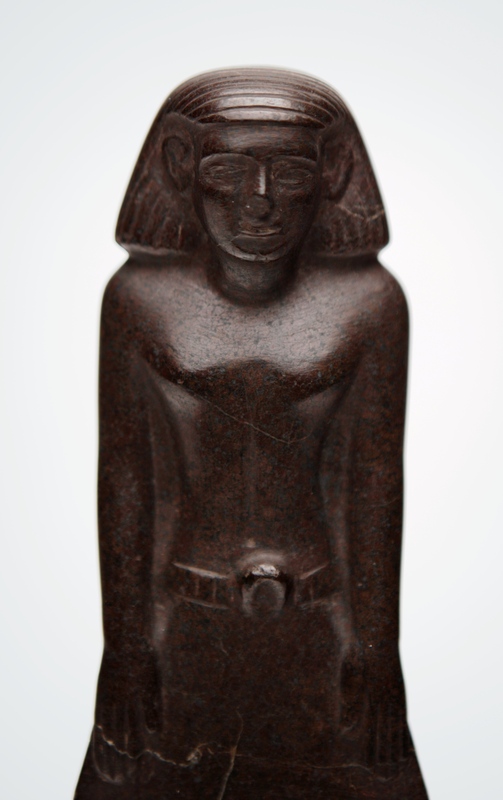 It’s hard to read in this case, but the name appears to be “Neb-Senu.” According to Price, the Egyptians believed that these statuettes could act back-up vehicles for the spirit of the departed in the afterlife should the mummy be destroyed. Perhaps the soul of Neb-Senu felt like pirouetting. The mummy and the statuette have been separate since at least 1933 when it was donated to the museum by Annie Barlow, daughter of Bolton cotton mill magnate James Barlow. The mill imported a great deal of cotton from Egypt and Annie became fascinated with Egyptian archaeology. She was a prominent supporter of the Egypt Exploration Society (EES) and personally traveled to its excavation on the Nile Delta in 1888. This was a bold choice for a single 25-year-old woman at the time. She was also a generous donor to local museums. Under the partage system, archaeological teams were entitled to keep a percentage of any artifacts they found. Annie Barlow consistently gifted her share of EES loot to museums like the Chadwick Museum (now the Bolton Museum) and the Manchester Museum. Even as they indulge in a little fun with the allure of an exotic Egyptian religious source for the turning, the curators are well aware that there is most likely a simple physical explanation. Vibration from visitors walking by the case or from traffic outside could cause the movement, but it’s still odd that the statue has never moved before and that none of the other statuettes in the case move an inch. 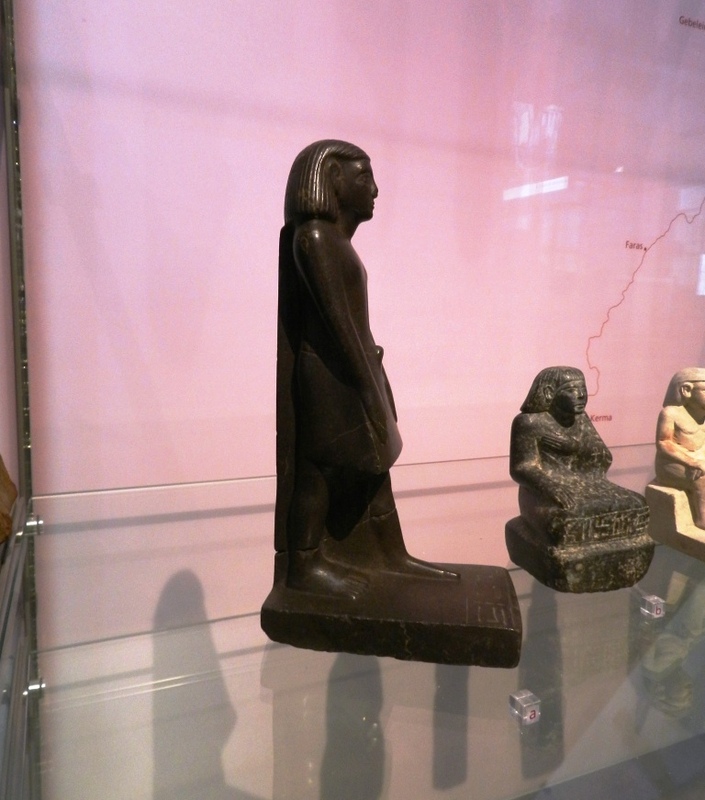 To solve the mystery of the spinning statuette, the Manchester Museum staff set up a time-lapse camera to take one picture a minute for a week. This is the extremely awesome result. Nobody is punking the museum. Neb-Senu is definitely moving on his own. Eat your heart out, Night at the Museum (that movie was such a disappointment). Particle physicist and TV host Brian Cox weighed in on the issue. Not surprisingly, he does not attribute the statuette’s dance to ancient Egyptian spirits, but rather to differential friction. Curator Campbell Price is still mystified. I asked an extremely smart scientician type I know for clarification and he explained that it’s not just the two surfaces — stone and glass — which have different friction coefficients, but different parts of the statue’s base. You can clearly see in pictures that the base is uneven. There are lumps and bumps, missing bits, smoother parts, rougher parts. That means some parts of the base are going to experience more friction against the glass shelf than others. If one corner is rougher, then when the vibrations from the floor or the outside put lateral stress on the shelf, that rougher corner with the highest friction will stay put while the rest of the base rotates around it. That doesn’t explain why it would start in February all of a sudden, but the statuette and its shelf are in the museum’s new Egyptian Afterlife gallery and even a small change in the circumstances — a cleaning or polishing of the statue, increased vibrations from, say, construction work — could have caused the not-all-that-wild rumpus to begin. This entry was posted on Monday, June 24th, 2013 at 11:09 PM	and is filed under Ancient, Museums. You can follow any responses to this entry through the RSS 2.0 feed. You can skip to the end and leave a response. Pinging is currently not allowed. To me, it seems that most of the rotation happens during the daytime. I suspect that the vibration causing the rotation is mainly due to the visitors stomping around on the floor. To prevent the rotation, the curators could stand the statue on another material – maybe just slide a piece of paper between the statue and the shelf. I bet that accurately leveling the shelf / cabinet with a spirit level would help too. The museum is getting plenty of extra attention because of the spinning statue and probably lots of extra visitors. They’re probably in no rush to stop the rotation; I bet other museums are wondering what they need to do to get their exhibits to rotate too! I think they should rather opt. for a better surveillance method like cctv or something. Just for us to be sure that the museum isn’t doing it as a publicity stunt..
I’m with ceptimus, just put something under it felt, paper etc. and film. The “Weeping Madonna” principle. Packs in the credulous every time. It’s obviously a ploy by Old Man Carruthers to drive business away from the museum so he can buy the land out from under the museum for cheap and build another Starbucks! I believe Osiris demands a little disco music, some flashing lights, and a mirrorball. Definitely my favorite news item of the month! If I had dreamed this up in one of my ancient Egypt novels, critics would have scoffed! I love this!!! This one is easily explainable by the vibration but there are a few others mostly mummies in the dungeons of museums that they just keep out of site because the are way too weird and scare the guards. One in the British museum kept cracking its glass case, even a new perspex case started showing small cracks starting from the inside out,so they just shipped it down into the bowels of the storage facility, it’s been there since the 80s. Another small statue just kept moving itself around(in the Ashmolean I think), out of one locked case into another, it even moved itself to a different floor once with no logical explanation. It made its final escape in the 50’s and hasn’t been seen since. Of course, despite the video, it still might be a hoax. If the phenomenon is real, however, it either was ‘designed’ that way, or is coincidental. Misteriously spinning statues must also back then have been a ‘miracle’. Remarkably, the video does not show the ‘full circle’. Key for an explanation might be indeed the surface(s), vibration, mass and material(s). Stone for instance could be magnetic and metals for instance (thermo) bi-metallic. Does the deceased and/or his representative spin during daylight, but without visitors ? Does Catholicism know of spinning statues ? A bit of ancient egyptian bitumen should be able to stop the afterlife movement. I liked your reply and I also liked some of your knowledge and would like to know about any books or other reading materials or sources for the information you presented.Have you read the book “The Search For Omm Sety” written by Jonathan Cott? Neb-Senu’s clearly spinning in the grave. Maybe the statue of Neb-Senu is telling anyone who will pay attention to it’s movement that it wants to be repatriated with the mummy and coffin of Neb-Senu which are in a different museum….or maybe the remains and the statue would just like to go “home” back to Egypt. I was very surprised to learn, when watching a program called “Museum Secret’s” that it was popular in the 1800’s for people of wealth to have an “Egyptian Room” or Egyptian artifacts in their homes..including mummies.. as status symbols and in Canada, Toronto I think, a mummy was given to the local museum from a private collection, and it turned out to be a very important mummy which was later returned to Egypt. Maybe it’s the rest of the world that is spinning? Certainly the rest of the world is spinning….maybe Neb-Senu would just like a cold one…as in what does a guy have to do to get a drink around here? I think the Ashmolean Museum should be commended; this type of exhibit is a fun type, interactive one, and the mummy is getting the offering of it’s virtual food…everybody is happy! Are you scared ? are you scared it might well be supernatural? are you scared that THRE WELL MAY BE MORE than “science” realises out there ? Which scientists have claimed they have all possible knowledge? I can’t think of a single one. The movement of the statue was going on some months ago and I wonder if there is any further movement or if the movement has stopped.